First off, let me state for the record that I am not Irish. In fact, I’m British born, raised in America and was married to an American raised Italian. 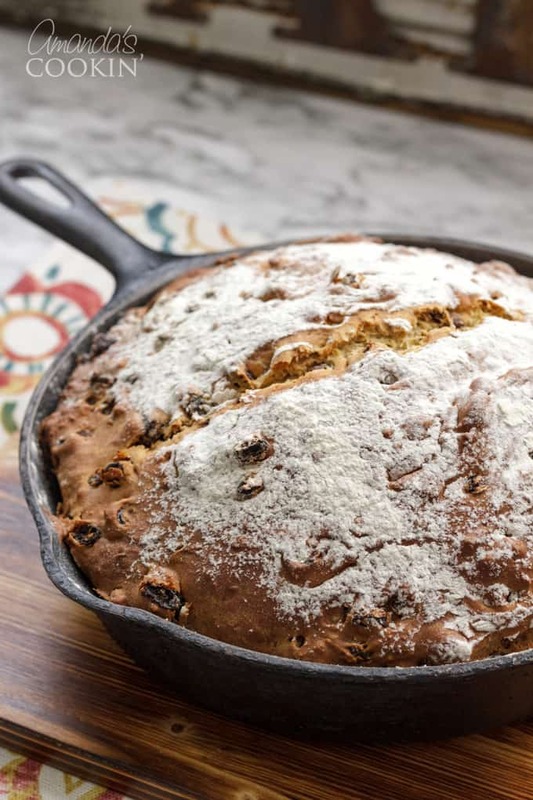 Suffice it to say you don’t have to be Irish to enjoy Irish Soda Bread. And hey, St. Patrick’s Day is not only for green beer, shamrock shakes, and jello shots! Seems there’s some debate about what constitutes a real Irish Soda Bread. Some say no raisins, some say yes raisins. 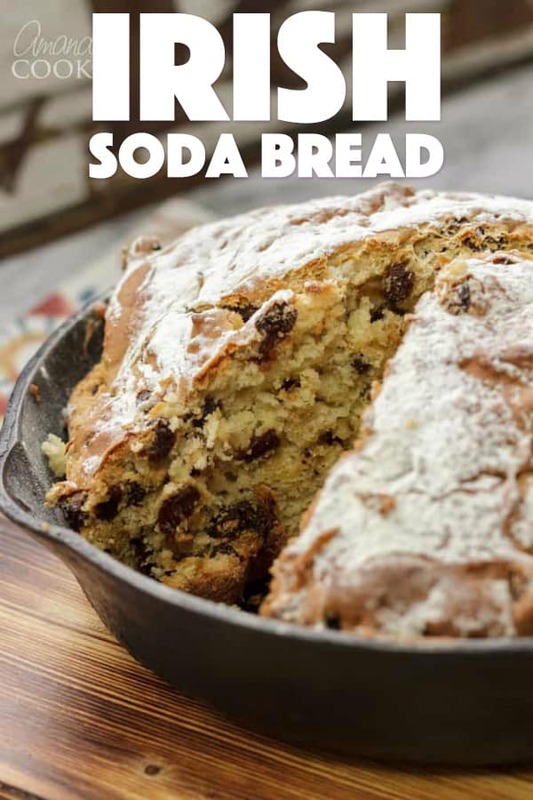 According to this site, if it has raisins it’s actually not soda bread. They also say if it contains raisins, eggs, baking powder, sugar or shortening, it’s then called a cake, not a bread. But in America, we call this a quick bread. Some say this is actually called Spotted Dog or even Railway Cake. I read on another website that Spotted Dog is a “traditional Irish fruit bread also referred to as Railway Cake”. No matter what you want to call it I know it’s totally delicious. Reminds me of eating raisin bread when I was a little girl. 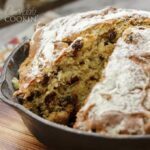 So whether it’s Irish Soda Bread, Spotted Dog or Railway Cake, this is a marvelous recipe, one I will make again and again. Don’t be alarmed by the number of raisins. Yes, it says 3 cups! It’s the perfect amount and has just the right amount of sweetness to be perfect for breakfast too. Enjoy it with a cup of Irish coffee on St. Patrick’s Day morning, or if you need something to nibble with your evening Bailey’s Coffee Float! 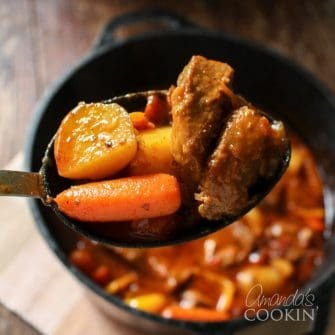 St, Patrick’s Day is actually quite a fun food holiday, but it comes and goes quickly. So be sure to prepare by printing out my Shamrock Shaped Brownies, Rainbow Fudge, and this Corned Beef and Cabbage. 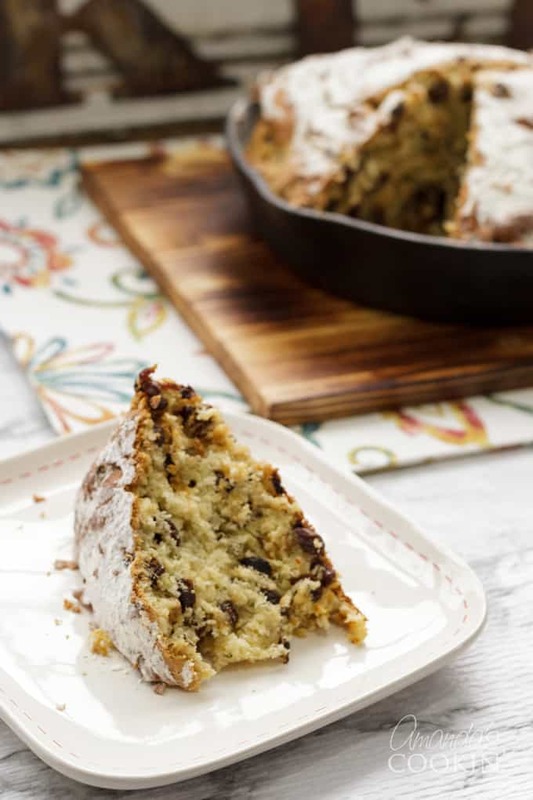 Enjoy a slice of this raisin studded quick bread with your Irish coffee this St. Patrick's Day! Preheat oven to 350 degrees F (175 degrees C). 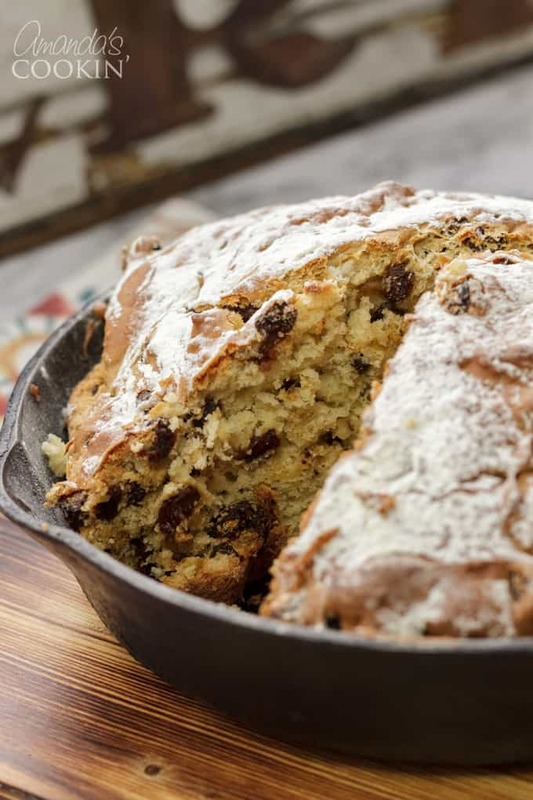 Grease a 9-inch round cast iron skillet or a 9 inch round cake pan. 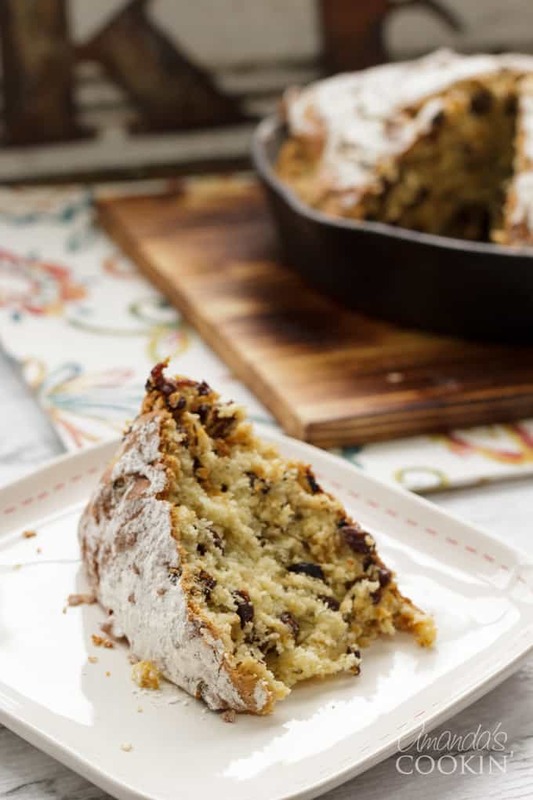 In a mixing bowl, whisk together flour (reserving 1 tablespoon), sugar, baking powder, baking soda, and salt. Stir in raisins and caraway seeds. In another bowl, whisk eggs, buttermilk and sour cream. Stir the liquid mixture into flour mixture just until flour is moistened. Use wooden spoon to mix/knead dough in bowl about 10 to 12 strokes. Dough will be very sticky, similar to a loose cookie dough. Place the dough in the prepared skillet or pan and pat down. Cut a 4" x 3/4" inch deep slit in the top of the bread. Dust with reserved flour. Bake in preheated oven for 65 to 75 minutes. Let cool and turn bread onto a wire rack. A wonderful recipe. Thank you.